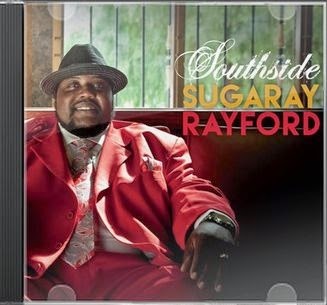 I just received the newest release (May 19, 2015), Southside, from Sugaray Rayford and it's got a great groove! Opening with Southside Of Town, Ralph Carter develops a great walking bass line stage for Rayfords solid vocals. Backed by Allan Walker on sax and Gary Bivona on trumpet as well as Jade Bennett, Zara Davis and Rachele Quiogue on vocals, Leo Dombecki lays out a nice keyboard solo and Gino Matteo rips on guitar continuing under the vocals throughout the track. Very nice! Slinky funk track, Miss Thang, again is heavily reliant on the bottom provided by Carter as well as Lavell Jones on drums. Rayford adds girth with his beefy vocals and Matteo rides the funky wave with tight guitar riffs. High stepping, Live To Love Again, really gets you moving and with horn and guitar punctuation is a clear radio play hit. Matteo lays out a crisp guitar solo and Walker and Bivona add warmth. Excellent! On shuffle track, Texas Bluesman, Matteo really take a nice guitar solo. Rayford chides him on with names of some of the all time greats as he builds a frenzy. Take It To The Bank is a simple acoustic blues track with only acoustic guitar, Rayford on vocal and Bob Corritore laying down some sweet harp riffs. Smooth R&B track Call Off The Mission, has a real cool sway as Rayford masterfully crafts his melody. I particularly like Jones sense of rhythm dynamics on this track punched by Bivona and Walker on horns. Bennett, Davis and Quiogue really ad a nice warmth to this track. Very nice! All I Think About is another high stepper with solid sax bottom. A swaying bridge by the horns give the track and rounder feel and a Billy Preston like keyboard solo adds some funk to the mix. Slow bluesy ballad, Take Away These Blues, gives Rayford a chance to really stand his ground and air out his pipes. Cool reverb on the guitar and horns on the top help to balance this special track on the release. Wrapping the release is Slow Motion, a classic soul style track and a real gripper. Matteo holds it down with atmospheric guitar effects and the horns creating tension. This is a really solid conclusion to a soulful new release from Sugaray.